Examples in above article concern about ASP.NET where specifying path like ‘Page1.aspx’ is enough. When I started mapping this knowledge to ASP.NET MVC, first time I failed. Note here: specifying the path started from ~/ (root in MVC) is not allowed here and will not be resolved to the proper path! On my main project we use heavily the awesome log4net framework. It could be quite easily configured but for some advanced configuration I need to constantly check the documentation. I personally prefer to have all required knowledge on how write configuration in Visual Studio. Fortunately VS allows to add intellisense support for custom configuration section (like log4net or whatever you want). Open file for edit. Its properties window should be seen in the bottom right corner of the VS editor (default settings). You could see tons of already included XSD schemas that makes editing configuration file so playful! Click on “Add” to choose schema. I downloaded log4net XSD here beforehand. Then you will see new schema now included into the configuration file schemas. The last this is to test it. Start typing app. Looks like it work now. Great! 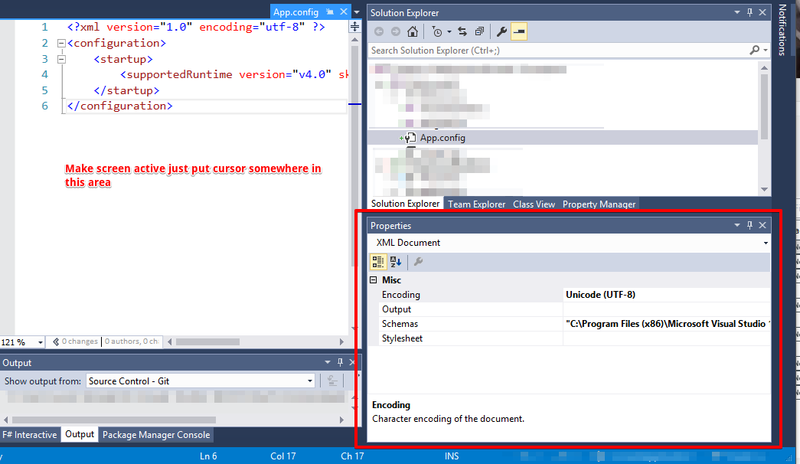 So this was a tip on how to include custom configuration section intellisense support. For really large XML documents larger than 100 MB the idea to load entire document in memory could be not the best choice. Now let’s consider the other ways for reading those large files. Now let’s see the performance time (in milliseconds) comparison for different approaches of dealing with large XML docs. It is easy to see that the fastest approach to parse large XML documents is using XmlSerialiser class which is also the most elegant and concise. It uses instance of XmlReader as input parameter so does not load entire document into memory. The “looser” is using LinqToXml. It loads the entire xml into memory so that it document is really huge that OutOfMemory exception is possible there. But on not really large amount of data (something below 1.000.000 entire objects packed inside xml) this is neglectible. For extremely large documents use either XmlSerialiser.Deserialise() method if you need the entire objects from xml, or use XmlReader if you need only part of the data. It will prevent you from OutOfMemory exception and performance bottlenecks.